Home Editorial Short Tribute to Maya Angelou and why it matters to the Autism Community. Now reading: Short Tribute to Maya Angelou and why it matters to the Autism Community. Maya Angelou passed from this world today at the age of 86 and leaves with her a legacy that will stand the test of time. Not only was she an amazing writer, poet and wonderful orator with that deep voice of hers etc. but she was a role model to every woman… of all colours, all mothers, sisters, daughters whether they are NT or asperger’s. She should be a role model for all men as well. Wikipedia lists her occupations as: Poet, civil rights activist, dancer, film producer, television producer, playwright, film director, author, actress, professor but as we all know…she was so much more. Her quotes were never of the “sappy Hallmark” kind but truly inspirational. There are so many quotes I could have chosen but this one spoke to me for all the girls and women out there on the spectrum who are trying to find their own voice. While I do not think it is accurate, Don Swaim, an American journalist and broadcaster, suggested during an interview with Dr. Angelou back in 1987 that she might in fact be autistic. I found this tweet from her speech. 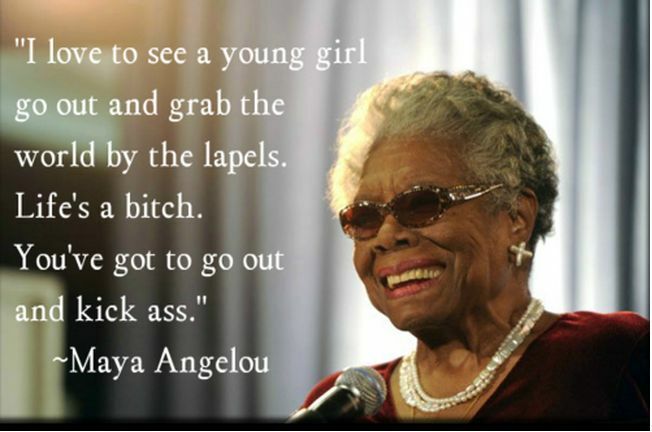 The same can be said of Dr. Angelou… Thank you. You will be missed. RIP Maya.